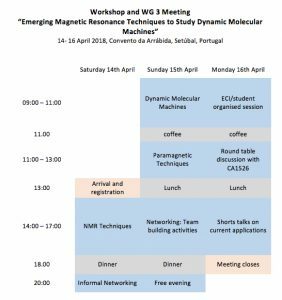 This WG3 workshop will cover the state of the art in advanced magnetic resonance methods. Specific methods that will be covered include; Solid State NMR, in-cell NMR, STD-NMR, Paramagnetic NMR, DNP and EPR methodologies. 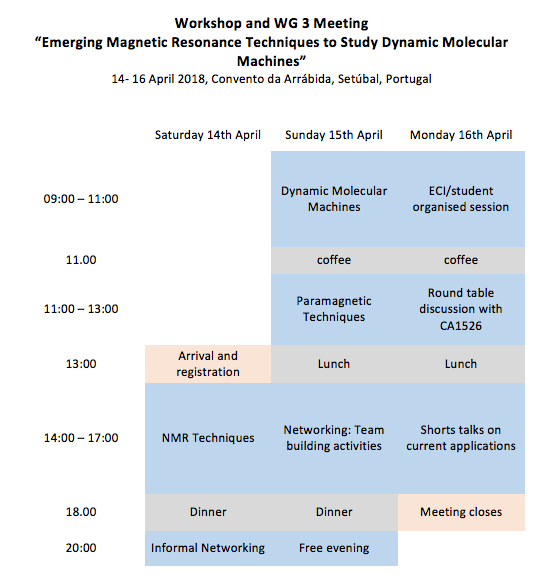 The workshop will have a mixture of invited talks, ECI and PhD talks as well as various small group discussions. We will also cover a range of key molecular machines represented from the CM1306 Action, namely dynamic membrane transport proteins. The workshop will also include short presentations by the attendees as well as a project troubleshooting session where the course attendees can present specific challenges in their own projects for advice from the invited speakers. A representative from the CA15126– Between Atom and Cell: Integrating Molecular Biophysics Approaches for Biology and Healthcare (ARBE-MOBIEU) COST Action will also participate and a round table discussion about future COST (and other EU funding stream) applications will take place. The workshop will run from mid-afternoon on Saturday 14rd April to early evening on Monday 16th April. Space is limited to ca. 10-15 attendees. Registration will be on a first-served, first come basis with bursaries available for attendees. Please complete the online-registration ASAP (provisional deadline April 8th), Places for eligible applicants will be awarded on a first-come first served basis. Acceptance will be notified by April 9th, 2018. Gender and country balance may also be taken into account when evaluating eligibility. Would you like the Local-Organiser to book accomodation? Would you like to apply for an reimbursement? Do you have a specific magnetic resonance problem you would like to discuss?